Experiencing Alice Cooper: A Listener’s Companion takes a long overdue look at the music and stage act of rock music’s self-styled arch-villain. A provocateur from the very start of his career in the mid-1960s, Alice Cooper, aka Vince Furnier, son of a lay preacher in the Church of Jesus Christ,... read more carved a unique path through five decades of rock’n’roll. 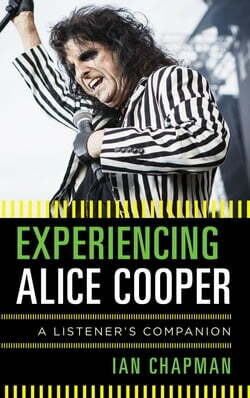 In Experiencing Alice Cooper: A Listener’s Companion, Ian Chapman surveys Cooper’s career through his twenty-seven studio albums (1969-2017). While those who have written about Cooper have traditionally kept their focus on the stage spectacle, too little attention has been paid to Cooper’s recordings. Throughout, Chapman argues that while Cooper may have been rock’s most accomplished showman, he is first and foremost a musician, with his share of gold and platinum albums to vouch for his qualifications as a musical artist.